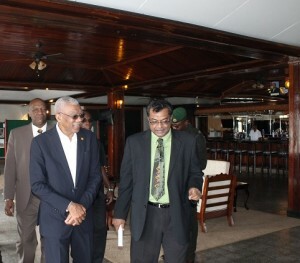 President David Granger and Minister of Public Security, Khemraj Ramjattan. In the background is Minister of State, Joseph Harmon. Public Service Minister, Khemraj Ramjattan is confident that Customs Anti-Narcotics Unit (CANU) would not be found culpable of drug trafficking, in the wake of allegations made by self-confessed drug trafficker Barry Dataram. “We were all there at the (National Security) Committee and we decided that , yes, once there is this allegation, whether it comes from a criminal, let’s have the committee….It is my view that, yes, CANU will be exonerated but, of course, let’s hear because off course I act on the presumption of innocence,” said Ramjattan, a lawyer by profession. CANU comes directly under the Ministry of Public Security. Speaking with reporters before the start of the 2016 Guyana Defence Force Officers Conference, Ramjattan said he disbelieved Dataram’s claims that significant percentages of drugs seized by CANU are sold on the streets and that at least one CANU agency takes as much as GYD$10 million to facilitate the smuggling of large amounts of drugs to the United States and Canada. The Public Security Minister reasoned that Dataram, who is wanted by the United States (US) to face drug trafficking charges, has leveled the accusations against CANU because he was currently facing trial for the possession of more than 100 kilogrammes of cocaine at a house at Diamond, East Bank Demerara last year. “I have an opinion on it and it’s because there is a certain charge that is right now going on, he probably feels that it is about time to tarnish the CANU officials but we are going to have an inquiry and I hope that the inquiry is going to bring out the truth,” he said. Ramjattan said government needed to pay attention to the claims and have them cleared up by a Board of Inquiry because the integrity and morale of the law enforcement agencies was vitally important. “That is what rocks your policing agency when the tarnishing, damaging comes and in this way it breaks the foundation of it. It kills and frustrates the officers and especially coming from fellows who are self-confessed drug dealers,” he said. Persaud assured that all drugs seized are tested in the presence of several respected officials before they are burnt or dumped into the sea several miles off the coast. “The procedures we adopt to do these things are to clear any doubts that there is anything else being destroyed,” he said. Dataram has said on HGPTV Nightly News that he would be willing to sacrifice his life to prove his allegations.